You can use eDiscovery cases in the Security & Compliance Center to control who can create, access, and manage eDiscovery cases in your organization. 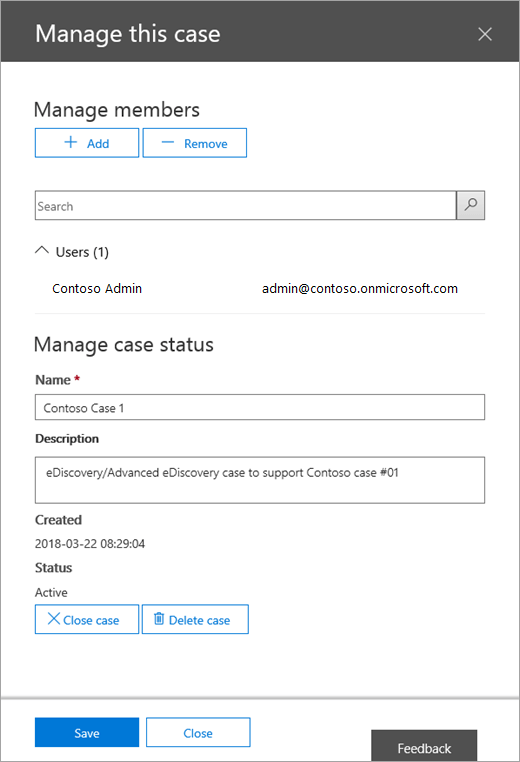 If your organization has an Office 365 E5 subscription, you can also use eDiscovery cases to analyze search results by using Office 365 Advanced eDiscovery. An eDiscovery case allows you to add members to a case, control what types of actions that specific case members can perform, place a hold on content locations relevant to a legal case, and associate multiple Content Searches with a single case. You can also export the results of any Content Search that is associated with a case or prepare search results for analysis in Advanced eDiscovery. eDiscovery cases are a good way to limit who has access to Content Searches and search results for a specific legal case in your organization. Use the following workflow to set up and use eDiscovery cases in the Security & Compliance Center and Advanced eDiscovery. The first step is to assign the appropriate eDiscovery-related permissions to people so you can add them to an eDiscovery case in Step 2. You have to be a member of the Organization Management role group (or be assigned the Role Management role) in the Security & Compliance Center to assign eDiscovery permissions. The following list describes the eDiscovery-related role groups in the Security & Compliance Center. ReviewerThis role group has the most restrictive eDiscovery-related permissions. Members of this group can only see and open the list of the cases on the eDiscovery page in the Security & Compliance Center that they are members of. They can't create cases, add members to a case, create holds, create searches, export search results, or prepare results for Advanced eDiscovery. However, members can access cases in Advanced eDiscovery to perform analysis tasks. eDiscovery ManagerMembers of this role group can create and manage eDiscovery cases. They can add and remove members, place content locations on hold, create and edit Content Searches associated with a case, export the results of a Content Search, and prepare search results for analysis in Advanced eDiscovery. There are two sub-groups in this role group. The difference between these subgroups is based on scope. eDiscovery ManagerCan view and manage the eDiscovery cases they create or are a member of. If another eDiscovery Manager creates a case but doesn't add a second eDiscovery Manager as a member of that case, the second eDiscovery Manager won't be able to view or open the case on the eDiscovery page in the Security & Compliance Center. eDiscovery Managers can also access their cases in Advanced eDiscovery to perform analysis tasks. View all cases that are listed on the eDiscovery page. Manage any eDiscovery case in the organization after they add themself as a member of the case. Perform administrative tasks in Advanced eDiscovery, such as processing case data for analysis, configuring case settings, and exporting data from Advanced eDiscovery. This is because a person who is an eDiscovery Administrator in the Security & Compliance Center is automatically added as an administrator in Advanced eDiscovery. See the More information section for reasons why you may want an eDiscovery Administrator in your organization. If a person isn't a member of one of these eDiscovery-related role groups, or isn't a member of a role group that's assigned the Reviewer role, you can't add them as a member of an eDiscovery case. In the Security & Compliance Center, click Permissions, and then do one of the following based on the eDiscovery permissions that you want to assign. To assign Reviewer permissions, select the Reviewer role group, and then next to Members click Edit. Click Choose members, click Add select the user that you want to add to the Reviewer role group, and then click Add. To assign eDiscovery Manager permissions, select the eDiscovery Manager role group, and then next to eDiscovery Manager, click Edit. Click Choose eDiscovery Manager, click ** Add **, select the user that you want to add as an eDiscovery Manager, and then click Add. To assign eDiscovery Administrator permissions, select the eDiscovery Manager role group, and then next to eDiscovery Administrator, click Edit. Click Choose eDiscovery Administrator, click Add, select the user that you want to add as an eDiscovery Administrator, and then click Add. After you've added all the users, click Done, click Save to save the changes to the role group, and then click Close. The next step is to create a new eDiscovery case. You must be a member of the eDiscovery Managers role group to create eDiscovery cases. 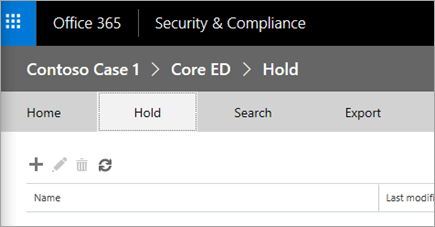 As previously explained, after you create a new case in the Security & Compliance Center, you (and other case members) will be able to access that same case in Advanced eDiscovery if you're organization has an Office 365 E5 subscription. In the Security & Compliance Center, click eDiscovery > eDiscovery, and then click Create a case. 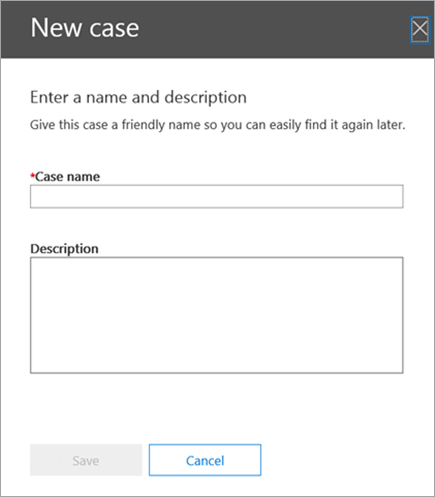 On the New Case page, give the case a name, type an optional description, and then click Save. Note that the case name must be unique in your organization. The new case is displayed in the list of cases on the eDiscovery page. Note that you can hover the cursor over a case name to display information about the case, including the status of the case ( Active or Closed), the description of the case (that was created in the previous step), and when the case was changed last and who changed it. After you create a new case, you can rename it anytime. Just click the name of the case on the eDiscovery page. On the Manage this case flyout page, change the name displayed in the box under Name, and then save the change. After you create a new case, the next step is to add members to the case. As previous explained, only users that are members of the Reviewer or eDiscovery Manager role groups can be added as a member of the case. Note that the eDiscovery Manager who created the case is automatically added as a member. In the Security & Compliance Center, click eDiscovery > eDiscovery to display the list of cases in your organization. Click the name of the case that you want to add members to. The Manage this case flyout page is displayed. Under Manage members, click Add to add members to the case. In the list of people who can be added as a member of the case, click the checkbox next to the name of the people you want to add to the case. If you have a large list of people who can added as members, use the Search box to search for a specific person in the list. After you've selected the people to add as members of the group, click Add. In Manage this case, click Save to save the new list of case members. Click Save to save the new list of case members. You can use an eDiscovery case to create holds to preserve content that might be relevant to the case. You can place a hold on the mailboxes and OneDrive for Business sites of people who are custodians in the case. You can also place a hold on the group mailbox, SharePoint site, and OneDrive for Business site for an Office 365 Group. Similarly, you can place a hold on the mailbox and site that are associated with Microsoft Teams. When you place content locations on hold, content is held until you remove the hold from the content location or until you delete the hold. You create an infinite hold where all content is placed on hold. Alternatively, you can create a query-based hold where only content that matches a search query is placed on hold. You can specify a date range to hold only the content that was sent, received, or created within that date range. Alternatively, you can hold all content regardless of when it was sent, received, or created. You can have a maximum of 10,000 hold policies across all eDiscovery cases in your organization. Click Open next to the case that you want to create the holds in. On the Home page for the case, click Hold. On the Hold page, click New . On the Create a new hold page, give the hold a name. The name of the hold must be unique in your organization. Choose the content locations that you want to place on hold. You can place mailboxes, sites, and public folders on hold. Mailboxes Click Add to specify mailboxes to place on hold. Use the search box to find user mailboxes and distribution groups (to place a hold on the mailboxes of group members) to place on hold. You can also place a hold on the associated mailbox for an Office 365 Group or a Microsoft Team. When you click Add to specify mailboxes to place on hold, the mailbox picker that's displayed is empty. This is by design to enhance performance. To add people to this list, type a name (a minimum of 3 characters) in the search box and click Search . Sites Click Add to specify SharePoint and OneDrive for Business sites to place on hold. Type the URL for each site that you want to place on hold. You can also add the URL for the SharePoint site for an Office 365 Group or a Microsoft Team. See the More information section for tips on putting Office 365 Groups and Microsoft Teams on hold. In the rare case that a person's user principal name (UPN) is changed, the URL for their OneDrive account will also be changed to incorporate the new UPN. If this happens, you'll have to modify the hold by adding the user's new OneDrive URL and removing the old one. Public folders Click Hold all public folders to put all of the public folders in your Exchange Online organization on hold. Note that you can't choose specific public folders to put on hold. Leave the Don't hold any public folders option selected if you don't want to put a hold on public folders. When you're done adding content locations to the hold, click Next. To create a query-based hold with conditions, complete the following. Otherwise, just click Finish to hold all content. 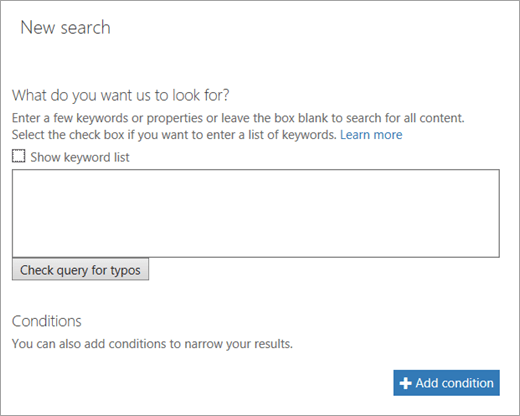 For more information about creating a search query and using conditions, see Keyword queries and search conditions for Content Search. In the box under What do you want us to look for?, type a search query in the box so that only the content that meets the search criteria is placed on hold. You can specify keywords, message properties, or document properties, such as file names. You can also use more complex queries that use a Boolean operator, such as AND, OR, or NOT. If you leave the keyword box empty, then all content located in the specified content locations will be placed on hold. Under Conditions, click Add condition to add one or more conditions to narrow the search query for the hold. Each condition adds a clause to the KQL search query that is created and run when you create the hold. For example you can specify a date range so that email or site documents that were created within the date ranged are placed on hold. A condition is logically connected to the keyword query (specified in the keyword box) by the AND operator. That means that items have to satisfy both the keyword query and the condition to be placed on hold. After configuring a query-based hold, click Finish to create the hold. After a while, information about the new hold is displayed in the details pane on the Holds page for the selected hold. This information includes the number of mailboxes and sites on hold and statistics about the content that was placed on hold, such as the total number and size of items placed on hold and the last time the hold statistics were calculated. These hold statistics help you identify how much content that's related to the eDiscovery case is being held. The total number of items on hold indicates the number of items from all content sources that are placed on hold. If you've created a query-based hold, this statistic indicates the number of items that match the query. The number of items on hold also includes unindexed items found in the content locations. Note that if you create a query-based hold, all unindexed items in the content locations are placed on hold. This includes unindexed items that don't match the search criteria of a query-based hold and unindexed items that might fall outside of a date range condition. This is different than what happens when you run a Content Search, in which unindexed items that don't match the search query or are excluded by a date range condition aren't included in the search results. 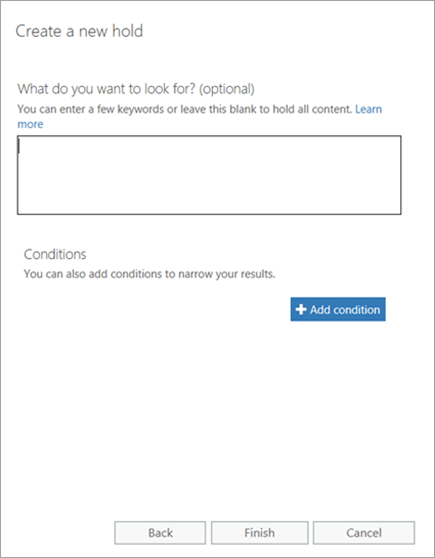 For more information about unindexed items, see Unindexed items in Content Search in Office 365. You can get the latest hold statistics by clicking Update statistics to re-run a search estimate that calculates the current number of items on hold. If necessary, click Refresh in the toolbar to update the hold statistics in the details pane. It's normal for the number of items on hold to increase over time because users whose mailbox or site is on hold are typically sending or receiving new email message and creating new SharePoint and OneDrive for Business documents. After an eDiscovery case is created and any custodians related to the case are placed on hold, you can create and run one or more Content Searches that are associated with the case. Content Searches associated with a case aren't listed on the Search page in the Security & Compliance Center. This means that Content Searches associated with a case can only be accessed by case members who are also members of the eDiscovery Manager role group. Click Open next to the case that you want to create a Content Search in. On the Home page for the case, click Search. On the Search page, click New . On the New search page, type a name for the search. Content Searches associated with a case must have names that are unique within your Office 365 organization. All case contentSelect this option to search all the content locations that have been placed on hold in the case. If the case contains multiple holds, the content locations from all holds will be searched when you select this option. Additionally, if a content location was placed on a query-based hold, only the items that are on hold will be searched when you run the content search that you're creating in this step. For example, if a user was placed on query-based case hold that preserves items that were sent or created before a specific date, only those items would be searched by using the search criteria of the content search. This is accomplished by connecting the case hold query and the content search query by an AND operator. See the More information section at the end of this article for more details about searching case content. Search everywhereSelect this option to search all content locations in your organization. 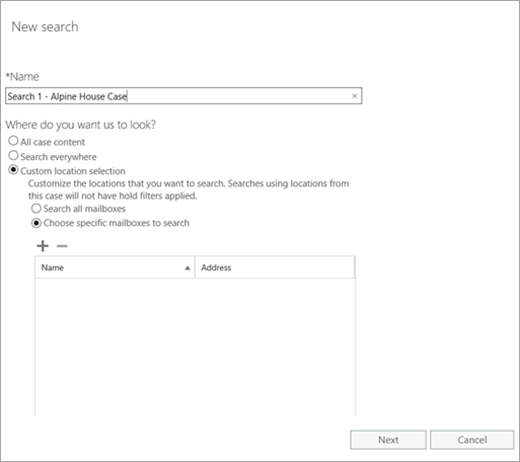 When you select this option, you can choose to search all Exchange mailboxes (which includes the mailboxes for all Office 365 Groups and Microsoft Teams), all SharePoint and OneDrive for Business sites (which includes the sites for all Office 365 Groups and Microsoft Teams), and all public folders. Custom location selectionSelect this option to select the mailboxes and sites that you want to search. When you select this option, the list of mailboxes and sites is pre-populated with the content locations that are placed on hold within the case. You can also choose to search all public folders in your organization. 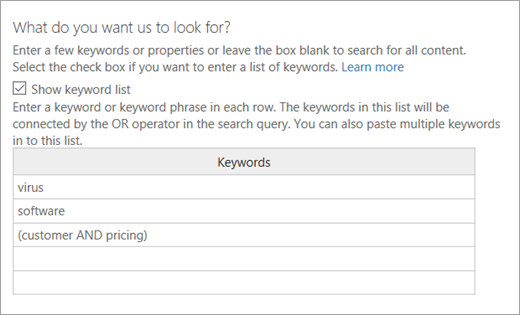 But if you select this option and search any content location that's on hold, any query from a query-based case hold won't be applied to the search query. In other words, all content in a location is searched, not just the content that is preserved by a query-based case hold. You can remove the pre-populated case content locations or add new ones. If you choose this option, you also have flexibility to search all content locations for a specific service (such as searching all Exchange mailboxes) or you can search specific content locations for a service. You can also choose whether or not to search the public folders in your organization. You can add inactive mailboxes, Office 365 Groups, Microsoft Teams, and distribution groups to the list of mailboxes to search. Dynamic distribution groups aren't supported. If you add Office 365 Groups or Microsoft Teams, the group or team mailbox is searched; the mailboxes of the group members aren't searched. If you don't want to include any mailboxes or sites in a search, select Choose specific mailboxes to search or Choose specific sites to search, but don't add mailboxes or sites to the list. To add sites click Add and then type the URL for each site that you want to search. You can also add the URL for the SharePoint site for Office 365 Groups and Microsoft Teams. After you selected the content locations to search, click Next. For more information about using the keywords list, see More information. For more information about creating a search query and using conditions, see Keyword queries for Content Search. The search is started. After a while, an estimate of the search results is displayed in the details pane. The estimate includes the total size and number of items that matched the search criteria. The search estimate also includes the number of the unindexed items in the content locations that were searched. The number of unindexed items that don't meet the search criteria will be included in the search statistics displayed in the details pane. If an unindexed item matches the search query (because other message or document properties meet the search criteria), it won't be included in the estimated number of unindexed items. If an unindexed item is excluded by the search criteria, it also won't be included in the estimate of unindexed items. After the search is completed, you can preview the search results. If necessary, click Refresh to update the information in the details pane. After a search is successfully run, you can export the search results. When you export search results, mailbox items are downloaded in PST files or as individual messages. When you export content from SharePoint and OneDrive for Business sites, copies of native Office documents and other documents are exported. A manifest file (in XML format) that contains information about every search result is also exported. You can export the results of a Export the results of a single search associated with a case or you can export the results of Export the results of multiple searches associated with a case. Click Open next to the case that you want to export search from. In the list of searches for the case, click the search that you want to export search results from, click Export , and then click Export the results. The Export search results page is displayed. The workflow to export the results from a Content Search associated with a case is that same as exporting the search results for a search on the Content search page. For step-by-step instructions, see Export search results from the Security & Compliance Center. When you export search results, you have the option to enable de-duplication so that only one copy of an email message is exported even though multiple instances of the same message might have been found in the mailboxes that were searched. For more information about de-duplication and how duplicate items are identified, see De-duplication in eDiscovery search results. After you start the export, click Export to display the list of export jobs that exist for that case. You might have to click Refresh to update the list of export jobs to display the export job that you just created. Note that export jobs have the same name as the corresponding Content Search with _Export appended to the end of search name. Click the export job that you just created to display status information in the details pane. This information includes the percentage of items that have been transferred to an Azure storage area in the Microsoft cloud. As an alternative to exporting the results of a single Content Search associated with a case, you can export the results of multiple searches from the same case in a single export. Exporting the results of multiple searches is faster and easier than exporting the results one search at a time. You can't export the results of multiple searches if one of those searches was configured to search all case content. only export the results of multiple searches for searches that are associated with an eDiscovery case. You can't export the results of multiple searches listed on the Content search page in the Security & Compliance Center. In the list of searches for the case, select two or more searches that you want to export search results from. To select multiple searches, press Ctrl as you click each search. Or you can select multiple adjacent searches by clicking the first search, holding down the Shift key, and then clicking the last search. After you select the searches, click Export , and then click Export the results. The **Export the search results for n searches ** page is displayed, where n is the number of searches that you're exporting results for. Note that you'll have to give the export job a name. The workflow to export the results from multiple content searches associated with a case is the same as exporting the search results for a single search. For step-by-step instructions, see Export search results from the Security & Compliance Center. When you export search results from multiple searches associated with a case, you also have the option to enable de-duplication so that only one copy of an email message is exported even though multiple instances of the same message might have been found in the mailboxes that were searched in one or more of the searches. For more information about de-duplication and how duplicate items are identified, see De-duplication in eDiscovery search results. After you start the export, click Export to display the list of export jobs that for that case. You might have to click Refresh to update the list of export jobs to display the export job that you just created. Note that the searches that were included in the export job are listed in the Searches column. When you export the results of multiple searches, the search queries from all the searches are combined by using OR operators, and then the combined search is started. The estimated results of the combined search are displayed in the details pane of the selected export job. The search results are then transferred to the Azure storage area in the Microsoft cloud. The status of the transfer is also displayed in the details pane. As previously stated, after all the search results have been transferred, you can download them to your local computer. The maximum number of keywords from the search queries for all searches that you want to export is 500. (this is the same limit for a single Content Search). That's because the export job combines all the search queries by using the OR operator. If you exceed this limit, an error will be returned. In this case, you'll have to export the results from fewer searches or simplify the search queries of the searches that you want to export. The search results that are exported are organized by the content source the item was found in. That means a content source in the export results might have items returned by different searches. For example, if you chose to export email messages in one PST file for each mailbox, the PST file might have results from multiple searches. If the same email item or document from the same content location is returned by more than one of the searches that you export, only one copy of the item will be exported. You can't edit an export for multiple searches after you create it. For example, you can't add or remove searches from the export. You'll have to create a new export job to change which search results are exported. After a export job is created, you only can download the results to a computer, restart the export, or delete the export job. If you restart the export, any changes to the queries of the searches that make up the export job won't affect the search results that will be retrieved. When you restart an export, the same combined search query job that was run when the export job was created will be run again. If you restart an export from the Exports page in an eDiscovery case, the search results that are transferred to the Azure storage area will overwrite the previous results; the previous results there were transferred won't be available to be downloaded. Preparing the results of multiple searches for analysis in Advanced eDiscovery isn't available. You can only prepare the results of a single search for analysis in Advanced eDiscovery. If your organization has an Office 365 E5 subscription, you can prepare the results of Content Searches associated with a case for analysis in Advanced eDiscovery. After you prepare search results, you can go to Advanced eDiscovery (see Step 8: Go to the case in Advanced eDiscovery) and process the search result data for further analysis in Advanced eDiscovery. When you prepare search results for Advanced eDiscovery, optical character recognition (OCR) functionality automatically extracts text from images. OCR is supported for loose files, email attachments, and embedded images. This allows you to apply the text analytic capabilities of Advanced eDiscovery (near-duplicates, email threading, themes, and predictive coding) to any text in image files. Click Open next to the case that you want to prepare search results for analysis in Advanced eDiscovery. On the Home page for the case, click Search, and then select the search. In the details pane, under Analyze results with Advanced eDiscovery, click Prepare results for analysis. Choose to prepare indexed items, indexed and unindexed items, or only unindexed items for analysis in Advanced eDiscovery. Choose whether to include all versions of documents found on SharePoint that met the search criteria. This option appears only if the content sources for the search includes sites. Specify whether you want a notification message sent (or copied) to a person when the preparation process is completed and the data is ready to be processed in Advanced eDiscovery. The search results are prepared for analysis with Advanced eDiscovery. In the details pane, click Check preparation status to display information about the preparation process. When the preparation process is finished, you can go to the case in Advanced eDiscovery to process the data for analysis. After you create a case in the Security & Compliance Center, you can go to the same case in Advanced eDiscovery. Click Open next to the case that you want to go to in Advanced eDiscovery. On the Home page for the case, click Switch to Advanced eDiscovery. The Connecting to Advanced eDiscovery progress bar is displayed. When you're connected to Advanced eDiscovery, a list of containers is displayed on the page. These containers represent the search results that you prepared for analysis in Advanced eDiscovery in Step 7. Note that the name of the container has the same name as Content Search in the case in the Security & Compliance Center. The containers in the list are the ones that you prepared. If a different user prepared search results for Advanced eDiscovery, the corresponding containers won't be included in the list. To load the search result data from a container to the case in Advanced eDiscovery, select a container and click Process. For information about how to process containers, see Run the Process module and load data in Office 365 Advanced eDiscovery. Click Switch to eDiscovery to go back to the same case in the Security & Compliance Center. If the case contains any content locations on hold, those holds will be turned off. This might result in content being permanently deleted or purged, either by the user or by an automated process, such as a deletion policy. Closing a case only turns off the holds that are associated with that case. If other holds are place on a content location (such as a Litigation Hold. a Preservation Policy, or a hold from a different eDiscovery case) those holds will still be maintained. The case is still listed on the eDiscovery page in the Security & Compliance Center. The details, holds, searches, and members of a closed case are retained. You can edit a case after it's closed. For example, you can add or removing members, create searches, export search results, and prepare search result for analysis in Advanced eDiscovery. The primary difference between active and closed cases is that holds are turned off when a case is closed. Click the name of the case that you want to close. Under Manage case status, click Close case. On the Details page, click Close case. A warning is displayed saying that the holds associated with the case will be turned off. Click Yes to close the case. The status on the Manage this case flyout page is changed from Active to Closing. On the eDiscovery page, click Refresh to update the status of the closed case. It might take up to 60 minutes for the closing process to complete. When the process is complete, the status of the case is changed to Close on the eDiscovery page. Click the name of the case again to display the Manage this case flyout page, which contains information about when the case was closed and who closed it. When you re-open a case, any holds that were in place when the case was closed won't be automatically reinstated. After the case is re-opened, you'll have to go to the Hold page and turn on the previous holds. To turn a hold on, select it and click Turn it on in the details pane. Click the name of the case that you want to re-open. Under Manage case status, click Reopen case. A warning is displayed saying that the holds that were associated with the case when it was close won't be turned on automatically. Click Yes to re-open the case. The status on the Manage this case flyout page is changed from Closed to Active. On the eDiscovery page, click Refresh to update the status of the re-opened case. It might take up to 60 minutes for the re-opening process to complete. When the process is complete, the status of the case is changed to Active on the eDiscovery page. **Are there any limits for eDiscovery cases or holds associated with an eDiscovery case? **The following table lists the limits for eDiscovery cases and case holds. **What about cases that were created on the case management page in Advanced eDiscovery? **You can access a list of older Advanced eDiscovery cases by clicking the link at the bottom on the eDiscovery page in the Security & Compliance Center. However, to do any work in an older case, you have to contact Office 365 Support and request that the case be moved to a new eDiscovery case in the Security & Compliance Center. If a person who is the only member of an eDiscovery case leaves your organization, no one (including members of the Organization Management role group or another member of the eDiscovery Manager role group) can access that eDiscovery case because they aren't a member of a case. In this situation, there would be no way to access the data in the case. But because an eDiscovery Administrator can access all eDiscovery cases in the organization, they can view the case in the Security & Compliance Center and add themselves or another eDiscovery manager as a member of the case. Because an eDiscovery Administrator can view and access all eDiscovery cases, they can audit and oversee all cases and associated Content Searches. This can help to prevent any misuse of Content Searches or eDiscovery cases. And because eDiscovery Administrators can access potentially sensitive information in the results of a Content Search, you should limit the number of people who are eDiscovery Administrators. Finally, as previous explained, eDiscovery Administrators in the Security & Compliance Center are automatically added as administrators in Advanced eDiscovery. That means a person who is an eDiscovery Administrator can perform administrative tasks in Advanced eDiscovery, such as setting up users, creating cases, and adding data to cases. **What are the licensing requirements to place content locations on hold? **In general, organizations require an Office 365 E3 subscription or higher to place content locations on hold. To place mailboxes on hold, an Exchange Online Plan 2 license is required. For more information, see this FAQ. **What else should you know about searching all case content in Step 5? **As previously explained, you can search the content locations that have been placed on hold in the case. When you do this, only the content that matches the hold criteria is search. If there is no hold criteria, all content is searched. If contents are on a query-based hold, only the content that matches both hold criteria (from the hold placed in Step 4) and the search criteria (from the search in Step 5) is returned with the search results. If a content location is part of multiple holds within the same case, the hold queries are combined by an OR operator when you search that content location using the all case content option. Similarly, if a content location is part of two different holds, where one is query-based and the other is an infinite hold (where all content is placed on hold), then all content will be search because of the infinite hold. If a content search is for a case and you've configured it to search all case content and then you change a hold (by adding or removing a content location or changing the hold query), the search configuration is updated with those changes. However, you have to re-run the search after the hold is changed to update the search results. If multiple case holds are placed on a content location in an eDiscovery case and you select to search all case content, the maximum number of keywords for that search query is 500. That's because the content search combines all the query-based holds by using the OR operator. If there are more than 500 keywords in the combined hold queries and the content search query, then all content in the mailbox is searched, not just that content that matches the any of query-based case holds. If a case hold has a status of Turning on, you can still search the case content locations while the hold is being turned on. As previously stated, if a search is configured to search all case content, then you can't include that search if you want to export the results of multiple searches. If a search is configured to search all case content, then you'll have to export the results of that single search. What about placing a hold on Office 365 Groups and Microsoft Teams? Microsoft Teams are built on Office 365 Groups. Therefore, placing them on hold in an eDiscovery case is very similar. Keep the following things in mind when placing Office 365 Groups and Microsoft Teams on hold. To place content located in Office 365 Groups and Microsoft Teams on hold, you have to specify the mailbox and SharePoint site that associated with a group or team. When a user's mailbox is searched, any Office 365 Group or Microsoft Team that the user is a member of won't be searched. Similarly, when you place an Office 365 Group or Microsoft Team hold, only the group mailbox and group site are placed on hold; the mailboxes and OneDrive for Business sites of group members aren't placed on hold unless you explicitly add them to the hold. Therefore, if you the need to place an Office 365 Group or Microsoft Team on hold for a legal reasons, consider adding the mailboxes and OneDrive for Business sites for group and team members on the same hold. Conversations that are part of a Microsoft Teams channel are stored in the mailbox that's associated with the Microsoft Team. Similarly, files that team members share in a channel are stored on the team's SharePoint site. Therefore, you have to place the Microsoft Team mailbox and SharePoint site on hold to retain conversations and files in a channel. Alternatively, conversations that are part of the Chat list in Microsoft Teams are stored in the mailbox of the user's who participate in the chat. And files that a user shares in Chat conversations are stored in the OneDrive for Business site of the user who shares the file. Therefore, you have to place the individual user mailboxes and OneDrive for Business sites on hold to retain conversations and files in the Chat list. That's why it's a good idea to place a hold on the mailboxes of members of a Microsoft Team in addition to placing the team mailbox (and site) on hold. Users who participate in conversations that are part of the Chat list in Microsoft Teams must have an Exchange Online (cloud-based) mailbox in order to retain chat conversations when the mailbox is placed on an eDiscovery hold. That's because conversations that are part of the Chat list are stored in the cloud-based mailboxes of the chat participants. If a chat participant doesn't have an Exchange Online mailbox, you won't be able to retain chat conversations. For example, in an Exchange hybrid deployment, users with an on-premises mailbox might be able to participate in conversations that are part of the Chat list in Microsoft Teams. However in this case, content from these conversation can't be retained because the users don't have cloud-based mailboxes. Every Microsoft Team or team channel contains a Wiki for note-taking and collaboration. The Wiki content is automatically saved to a file with a .mht format. This file is stored in the Teams Wiki Data document library on the team's SharePoint site. You can place the content in the Wiki on hold by placing the team's SharePoint site on hold. The capability to retain Wiki content for a Microsoft Team or team channel (when you place the team's SharePoint site on hold) was released on June 22, 2017. If a team site is on hold, the Wiki content will be retained starting on that date. However, if a team site is on hold and the Wiki content was deleted before June 22, 2017, the Wiki content was not retained. 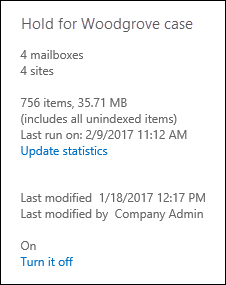 How do I find the URL for OneDrive for Business sites? 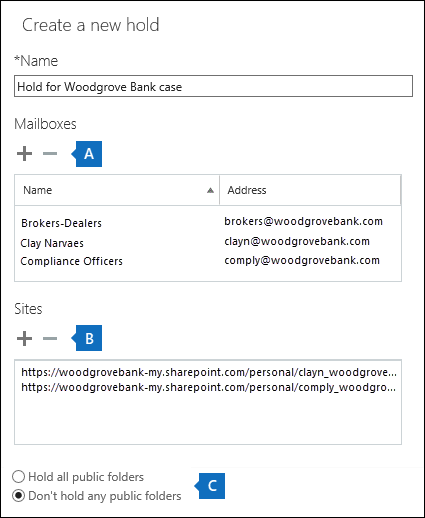 To collect a list of the URLs for the OneDrive for Business sites in your organization so you can add them to a hold or search associated with an eDiscovery case, see Create a list of all OneDrive locations in your organization. This script in this article creates a text file that contains a list of all OneDrive sites. To run this script, you'll have to install and use the SharePoint Online Management Shell. Be sure to append the URL for your organization's MySite domain to each OneDrive site that you want to search. This is the domain that contains all your OneDrive; for example, https://contoso-my.sharepoint.com. Here's an example of a URL for a user's OneDrive site: https://contoso-my.sharepoint.com/personal/sarad_contoso_onmicrosoft.com.